Quinoa Muffins are nutritious as well as delicious! Instead of oatmeal or bran muffins, how about making these delicious and healthy muffins for your family? These muffins are packed with protein, low carb, plus make the perfect breakfast treat for your family. You get all the deliciousness of a muffin without the carb overload! 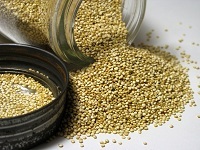 * Although quinoa is often considered a grain and treated as a grain, quinoa is actually the seed of a plant. It is related to leafy greens such as Swiss chard and spinach. Quinoa ranges in color from ivory to pinks, browns, and reds or almost black depending on the variety. Quinoa has a subtle, nutty flavor and a nice creamy texture with a light crunch. To purchase Quinoa, check out What's Cooking America's Cooking Store. Quinoa has a bitter coating (saponins) which needs to be rinsed away before use. Much of the quinoa sold commercially in North America is processed to remove this coating. However, I always rinse it anyway. I made the mistake of not doing so once and my quinoa tasted very bitter, not at all what I was expecting! Prepare Homemade Non-Stick Oil. Brush muffin pans with this mixture or spray with non-stick oil. I have found this provides a slightly crunchy on the outside yummy soft on the inside. Muffin liners do not work well with this recipe. In a large saucepan, bring the water to a boil. Add the quinoa and bring the mixture back to a boil; reduce heat to a simmer. Cover and cook for 15 minutes or until the liquid is absorbed and the quinoa is tender (you will see the rings separate from the grains). You will end up with 2 cups of cooked quinoa. Remove from heat and set aside to cool. You will have approximately 2 cups cooked quinoa. Be careful not to overcook the quinoa or to use more than the required amount of water. The grains of quinoa should be tender but separate, rather than mushy and clumped together. I cook up several cups at one time, divide into 2 cup portions, and freeze until ready to make muffins. In a large bowl, combine the cooled quinoa, flour, baking powder, sugar, and salt. Add the butter, pecans, grated ginger, milk, molasses, and dried fruit. Stir to combine. Fill the prepared muffin cups to their tops and bake approximately 30 or 40 minutes, until muffing tops are golden brown and just firm and until a toothpick inserted into the center of a muffin comes out clean. A good check is to use an instant digital thermometer to test your muffins. T he temperature of the muffin should be at 200 degrees F.
This is the type of cooking and meat thermometer that I prefer and use in my cooking. I get many readers asking what cooking/meat thermometer that I prefer and use in my cooking and baking. I, personally, use the thermometer shown in the photo on the right. Originally designed for professional users, the Super-Fast Thermapen Thermometer is used by chefs all over the world. Remove from oven and as soon as they have cooled enough to handle. Remove the muffins from pan and place on a wire rack to finish cooling (if desired). I have used 1 1/2 cups quinoa and more or less molasses. I have also used Bisquick instead of the flour mixture with no ill affects. I have also put larger or smaller amounts of nuts and fruit in. This is a very versatile recipe. Mix 1 part liquid lecithin and 2 parts canola oil in a small container. Store any unused portion of the lecithin/canola oil in refrigerator. Note: You can purchase liquid lecithin in health food stores or Whole Foods store. This Homemade Non-Stick Oil can be used to oil any pan. It prevents roasts, tomato based foods, any baked, etc. from sticking resulting in fast clean up.